Every marriage has conflict. In fact, famous marital researcher, Dr. John Gottman, says good marriages that last the test of time are not void of conflict. Healthy couples just know how to resolve these inevitable disagreements. It has been our experience as marital therapists for the last 40 years that most couples fight about superficial, surface issues, and often miss the real reasons that lie beneath their anger. The chronic conflict over your husband not cleaning up his crumbs from the counter may not really be about crumbs at all. There could be a deeper root. Finding the deeper root can help couples resolve conflict and even bring healing to each other. In the Soul Healing Love Model we help couples determine that deeper root by looking at their soul wounds. We define a soul wound as a need from childhood that was not met. Yes, you can have soul wounds in adulthood and especially in a previous dating relationship or marriage. All of us have soul wounds of one type or another. There is no perfect family, life, or situation. Romans 3:23 says, “All have sinned and fallen short of the glory of God.” But it is important to note that the purpose of recognizing your soul wounds is not to play the “blame game.” The reason we look at childhood first is that the wounds that occurred early in our development can cause the deepest emotional scars. These childhood soul wounds are also easily triggered in adult relationships, and can bring about a great deal of pain and emotion. In the brain past trauma is processed in the old brain, the seat of the limbic system where our fight flight or freeze mechanism is located. That means that when we sense real or perceived danger in our relationships we can over react emotionally. It is very hard to control your temper when soul wounds in the old brain are being triggered because when the limbic system is triggered it shuts off the new brain or the pre-frontal cortex which is the rational problem-solving part of the brain. Couples in high conflict are not in their rational mind and say and do things that are highly reactive and interactive. At that point they may not even be aware of the real issues underneath their anger. Because of this we have developed a communication technique designed in the Soul Healing Love Model that helps couples determine the root of their anger and stop unhealthy reactivity and interactivity. The tool is called The GIFT Exercise and i helps them deal with what is underneath their anger and know what they are really fighting about in the first place. The GIFT Exercise Psychodynamic anger theorists teach that anger is not a primary emotion. It is a secondary response to four primary emotions which are: Guilt, Inferiority, Fear, and Pain (Trauma). Since this list is hard to remember in the “heat of battle,” we developed an acronym to help couples remember it. 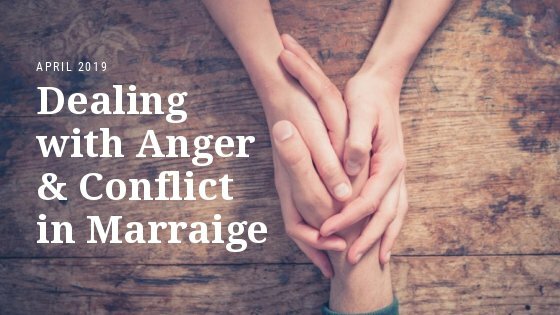 This process becomes a gift to the couple, enabling them to communicate through the impasse of conflict by recognizing the root of their rage. The GIFT Exercise also helps couples guard their words more carefully so that destructive, unhealthy anger is less likely to occur. Here is how we explain it to couples. We tell them that when they get angry hold their hand up and grab their thumb. Grabbing their thumb provides an anchor for them in the present and gets them out of the past and outside of their old brain. When they grab their thumb they will see 4 fingers which they are holding up. Label each finger. The index finger is GUILT, the middle is INFERIORITY, the ring finger is FEAR, and the pinkie is TRAUMA. In Anger Theory the emotion is actually PAIN but that would not make a good acronym so we substituted the word TRAUMA which is a close synonym. We instruct couples that when they are triggered and start getting reactive to grab their thumb and use their remaining fingers to identify their underlying emotion. Then they can explain what they are upset about more peacefully. So in the case of the wife who gets reactive over the crumbs on the counter in looking at the GIFT Exercise she realizes that this action on the part of her husband makes her feel Inferior. She feels unimportant and like a maid not a cherished wife. This is similar to the way she felt as a child when her single mom went to work and she was left with all the chores at a very young age. When the wife gets angry at the husband he feels Fear. He fears the anger will lead to more unhealthy actions. His wife’s anger reminds him of when he was yelled at as a child and lived in fear of his mom’s anger and sometimes rage. Using the GIFT Exercise helped them connect the dots and understand themselves and each other in a more healthy way. It also did 2 things. First they were aware of why they got so mad and couldn’t seem to get it under control and calm down, and secondly they were able to talk about the real problem instead of the superficial issues of the crumbs on the counter. Knowing why they were triggered and what that emotion was all about quelled their reactivity and interactivity and helped them talk in a more peaceful fruitful way. We have found that if one mate is calm and can explain the root of their anger, it causes the other mate to be calmer as well. This calmness allows them to move into their new brain and listen to each other instead of becoming reactive and defensive. Then they are in a place to problem solve and find workable solutions to their differences. Proverbs 15:1 says, “A gentle answer turns away wrath but harsh words cause quarrels.” The GIFT Exercise helps couples find the gentle answers they need that stop quarrels. It is sheer joy to watch a once-volatile couple talk peacefully about their differences and come to an understanding and work together to problem solve.